Since I last ran a reader Q&A a few weeks ago, I've received another compelling question. Reader Robert has an older Emachines desktop that recently developed a problem: "I installed a driver updater tool, and when I deleted it, it did something that changed my BIOS. The black screen appears when I boot up and reads: 'System BIOS shadowed. Check time and date settings. System CMOS checksum bad--default configuration used.'" 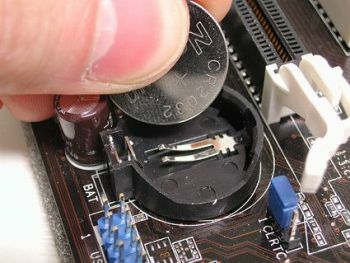 Most CMOS batteries are standard CR2032 "button" cells, which cost no more than a few bucks at your local drugstore, but check your motherboard documentation just to be safe. Replacing one is usually a two-minute job: pop out the old one, pop in the new one, and you're done. After that, you'll probably need to venture into the BIOS to reset the clock and double-check other system settings (like boot priority). Just be glad this didn't happen to your laptop. Laptops use CMOS batteries just like desktops, but on most models they're difficult--if not impossible--to replace. Which begs the question: After all these years, why haven't laptop manufacturers figured out a better way to power the CMOS? Not long ago a neighbor came to me with a malware-infested laptop. Some particularly nasty trojan had made its way onto the system (despite the presence of a certain big-name security suite, cough, ahem), rendering it more or less inoperable. The Start menu wouldn't work, programs wouldn't run, and I couldn't even get Task Manager to appear. In cases like these, I always turn to my trusty flash drive, which I keep equipped with a few of my favorite malware-busting security tools. And the best way I've found to make sure I have the latest versions of those tools is with SSDownloader (short for Security Software Downloader). When you launch it, you'll see five pretty self-explanatory tabs: Free Antivirus, Security Suites (Trial Versions), Malware Removal, Firewalls, and Other Tools. Within these tabs you'll find around 50 programs; check the box next to the ones you want to fetch, then click Download. It's that simple. Impressively, SSDownloader can auto-detect your operating system (Windows XP or Vista/7) and even whether it's 32- or 64-bit; it'll download the correct software versions accordingly. It doesn't run or install any of them, though--that part's up to you. Here's a random sampling of what's available: Avast Anti-Virus Free, Panda Internet Security (trial), Malwarebytes Anti-Malware (a personal favorite), HiJack This, Comodo Firewall Free, WinPatrol, LastPass, and CyberGhost VPN. In other SSDownloader makes it a snap to download a wealth of essential software--most of it freeware. The interface is a little rough around the edges, but I can't recommend this tool highly enough.